Ayala Land and Ayala Foundation officials sign an MOA for their continued partnership for community development initiatives at the Lio Tourism Estate in El Nido, Palawan. 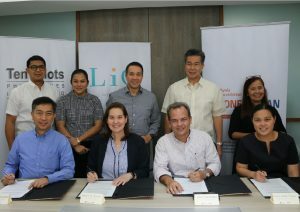 Present at the signing were (seated, from left) Romualdo Katigbak, chief finance officer, Ayala Foundation; Joanna Duarte, senior director for Programs, Ayala Foundation; Javier Hernandez, president of Ten Knots Philippines; Marian Isabelle Reyes, project lead for the Lio Tourism Estate; (standing, from left) Joey Bernardino, sales and marketing director, Ten Knots Development Corporation; Phearl Villaruel-Raz, chief finance officer, Ten Knots Philippines; Ruel Maranan, president, Ayala Foundation; Michael Alexis Legaspi, chief operating officer at Ayala Hotels and Ayala Land Hotels and Resorts; and Chiara Cruza, Project Lio manager, Ayala Foundation. 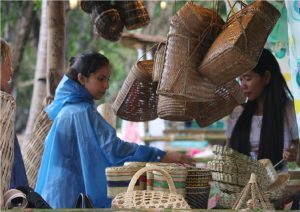 As economic activity in El Nido picks up, it also becomes important for people from El Nido communities to feel that they are part of their town’s progress. More than just being indirect recipients of economic development, people from communities should be active participants in ensuring progress. To allow for inclusive development in El Nido communities is what Ayala Land, through its subsidiary Ten Knots Philippines Inc., wishes to achieve. It partnered with Ayala Foundation for a five-year engagement to gather baseline information on community aspirations and capacities, and to oversee the design, implementation, and impact monitoring of a community development plan. 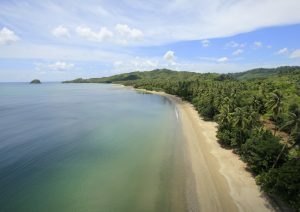 The program covers two barangays where the Lio Tourism Estate is located—barangay Villa Libertad and Pasadeña. As part of the initial engagement, Ayala Foundation conducted a rapid appraisal last year, as a way to understand the current conditions of the communities—their dreams and aspirations, their needs and capacities. The results of the rapid appraisal allowed ALI, Ayala Foundation, the residents, and other stakeholders understand one another, and thus proceed with the preparation of a community development plan, which the communities themselves prepared and will implement. The year 2017 serves as the kickoff year for the second phase of the engagement. Phase two cocer implementation of the community development plan, which involves different parallel projects undertaken by the stakeholders, and covering such areas as education, environment, infrastructure, health, and livelihood. To celebrate this milestone, representatives from Ten Knots Philippines, Ayala Hotels, and Ayala Foundation came together last July 28 for a ceremonial signing of the agreement for the second phase of the engagement. Present at the signing were Javier Hernandez, president of Ten Knots Philippines; Marian Isabelle Reyes, project lead for the Lio Tourism Estate; Phearl Villaruel-Raz, chief finance officer, Ten Knots Philippines; Joey Bernardino, sales and marketing director, Ten Knots Development Corporation; Joanna Duarte, senior director for Programs, Ayala Foundation; Romualdo Katigbak, chief finance officer, Ayala Foundation; and Chiara Cruza, Project Lio manager, Ayala Foundation. Serving as witnesses to the signing were Michael Alexis Legaspi, chief operating officer at Ayala Hotels and Ayala Land Hotels and Resorts, and Ruel Maranan, president of Ayala Foundation.